After losing former quarterbacks Zac Taylor (who was formally announced as the Bengals’ new head coach last week), the Rams are re-shuffling their offensive staff. Shane Waldron will be promoted from tight ends coach to quarterbacks coach while retaining his title as Los Angeles’ passing game coordinator, according to Albert Breer of TheMMQB.com (Twitter links). Meanwhile, senior offensive assistant Jedd Fisch will be named assistant coordinator/offense. How much these changes will actually affect the day-to-day — and game-to-game — operations for the Rams’ offense is unclear. Head coach Sean McVay will continue to call offensive plays, and Los Angeles still hasn’t formally replaced former offensive coordinator Matt LaFleur since he left for Tennessee following the 2017 season. But the moves are considered steps-up. As Breer notes in indicating Waldron will keep his passing game coordinator title, Waldron is merely shifting his position of focus — he’ll be as involved in the Rams’ offense as he ever was, if not more so. Waldron, who has also spent NFL time with the Patriots and Redskins, interviewed for Cincinnati’s head coaching vacancy earlier this year but lost out to his ex-coworker Taylor. Fisch, meanwhile, now has a title that sounds the closest to “offensive coordinator” of anyone on the Rams’ staff. The Jaguars’ OC from 2013-14, Fisch joined Los Angeles in 2018 and serves as the club’s clock management specialist. He interviewed for the head coaching job at Temple University earlier this year. We heard in early January that the Seahawks would begin contract negotiations with star QB Russell Wilson “soon,” but Adam Schefter of ESPN.com writes that the two sides have yet to have a single contract discussion. Wilson is under club control through the 2019 season and is set to earn $17MM next year, and he has previously stated he would be willing to play out the final year of his deal and perhaps go year-to-year under the franchise tag. But as Bob Condotta of the Seattle Times observes, the fact that Wilson and the Seahawks have not talked contract yet does not mean much (Twitter link). He says the team will get through other team-building matters first and then start exploring extensions, just as it did when it came time to explore a new deal with Wilson in 2015. We know that the Eagles want to trade Nick Foles, and yesterday we explored (again) how such a trade is likely to come about. While player and club would like to work “in concert” in determining Foles’ next team, ESPN’s Chris Mortensen (via Eliot Shorr-Parks of 94 WIP) says the Eagles are going to try to keep Foles out of the NFC East — the Redskins and Giants could be in the market — and would prefer to deal him to an AFC team. Meanwhile, Sheil Kapadia of The Athletic believes it only make sense for the Eagles to franchise Foles if they already have a trade in place, and that the recent chatter concerning the franchise tag is merely a bluff at this point. Schefter confirms a report from earlier this week that Panthers QB Cam Newton, who underwent arthroscopic shoulder surgery last week, is expected to be ready in time for training camp and certainly will be good to go when the regular season rolls around. Ian Rapoport of NFL.com says that the Rams, who signed running back C.J. Anderson in December, “absolutely” want to re-sign Anderson this offseason. That makes sense considering how good Anderson has been in his brief tenure with the club, and considering Todd Gurley‘s history of knee problems. Anderson, though, could be in line for a bigger role or salary than what Los Angeles is prepared to give. Anderson is expected to get plenty of work in tonight’s Super Bowl. 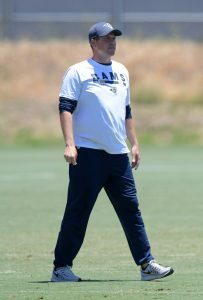 Rams QB coach Zac Taylor will be formally announced as the Bengals’ next head coach tomorrow, and Rapoport tweets that LA may move senior offensive assistant Jedd Fisch to QB coach. The club could also give current TE coach/passing game coordinator Shane Waldron the passing game coordinator title without requiring him to coach a position and bring in Wes Phillips to coach the tight ends. As expected, the Buccaneers will transition to a 3-4, one-gap defense under new defensive coordinator Todd Bowles, per Jenna Laine of ESPN.com. Laine looks at how the Bucs could deploy their current personnel to mirror Wade Phillips‘ success in transitioning two 4-3 defenses to 3-4 schemes. “He’s been phenomenal. He’s exceptional at what he does. Outstanding evaluator. There are a lot of guys on this roster that he brought to the table. Rashean Mathis, for example, is a guy that he saw on tape and he brought up his desire to work Rashean out. I was against it. I was saying this is an older guy — how is this guy going to help us. “He talked me into working him out and he had a phenomenal workout. He was exceptional in every way, shape and form, so we ended up signing him. Obviously he’s worked out great for us the last two years, having Rashean here. “He did a phenomenal job with the group and I think he has a lot of ability. I think he’s certainly capable of being a head coach in the NFL. I think I said that when he got here that at some point he’d have an opportunity to do that. Former Jaguars offensive coordinator Jedd Fisch will be joining Jim Harbaugh at Michigan, as Peter Schrager of Fox Sports tweets that he’ll be offered the pass game coordinator job with the Wolverines. Bruce Feldman adds that Fisch will also be the quarterbacks and receivers coach. Fisch was let go by Jacksonville in late December. We learned yesterday that the Texans wouldn’t be bringing back offensive line coach Paul Dunn, and the team has already found a replacement. Fox Sports’ Alex Marvez tweets that Houston will add Jets assistant coach Mike Devlin to their staff to replace Dunn. The Bears announced (on Twitter) that they interviewed Todd Bowles for their head-coaching position yesterday. Brad Biggs of the Chicago Tribune tweets that the interview went well, adding that the Cardinals defensive coordinator is set to meet with the 49ers today. Following up on a report that the Giants requested permission to interview Washington defensive backs coach Raheem Morris for their defensive coordinator opening, Mike Jones of the Washington Post tweets that Washington granted gave the division-rival Giants the green light, while Albert Breer of the NFL Network says (via Twitter) that the interview will happen this morning. Since leaving his role as Washington‘s defensive coordinator, Jim Haslett has received inquiries from a number of teams, according to Mike Jones of the Washington Post (Twitter link), who adds that it’s not clear yet whether he’ll interview for jobs. On the heels of a 3-13 season, the Jaguars have parted ways with offensive coordinator Jedd Fisch, according to Michael DiRocco of ESPN.com (via Twitter). At this point, it’s the only notable change to the team’s coaching staff or front office. Fisch, 38, was hired in January 2013, just two days after Gus Bradley was named Jacksonville’s new head coach. During his two years in Jacksonville’s Fisch’s offense has been perhaps the league’s worst — according to Football Outsiders, the Jags ranked 32nd in offensive DVOA in 2013, and placed 31st in 2014, ahead of only the 2-14 Buccaneers. Led by rookie quarterback Blake Bortles, Jacksonville’s offense also finished 31st in pass yards, with the club averaging an NFL-worst 15.6 points per game. As Ryan O’Halloran of the Florida Times-Union observes (via Twitter), Bradley has become close with Marc Trestman, who was fired by the Bears yesterday. In O’Halloran’s view, Trestman could be a top candidate for the Jaguars’ newly-opened offensive coordinator position. Adam Teicher says the Chiefs biggest need “in both the short and long terms” is at wide receiver. Mike Wells believes it’s too late for the Colts to reinforce their offensive line depth with a free agent like Richie Incognito. Firing offensive coordinator Jedd Fisch wouldn’t make “any sense” for the Jaguars, writes Michael DiRocco. A new O-coordinator would mean Blake Bortles would have to learn a new offensive, which is “virtually guaranteed” to stunt a young quarterback’s growth. Jamison Hensley believes the Ravens will add some depth at cornerback, wide receiver, tight end and offensive tackle in the offseason. Meanwhile, the writer says it would be “uncharacteristic” for the team to pursue top free agent defenders like Jason Pierre-Paul or Ndamukong Suh.